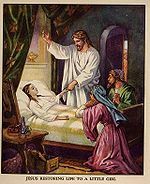 Healing of the woman by touching Jesus' garment, who had a hemorrhage for twelve years. A miracle is an act of supernatural intervention by God. Miracles are brought about by the immediate agency or the simple volition of God, without the use of mechanisms capable of being discerned by empirical senses, and in many cases designed to authenticate the divine commission of a religious teacher and the truth of his message. Monotheistic religions such as Judaism, Christianity, and Islam believe that the universe is the result of a miraculous act of creation by God. In addition to providing basic moral guidelines, the Bible is a history book that records God's creation and interaction with the physical realm. Miracles performed by God, Jesus, and their servants or disciples have taken place throughout history, including modern times. Such a supernatural history may indeed preclude a naturalistic interpretation of Earth history. Within the text of the Bible there are many documented miracles. They are all used by God to promote His divine plan for human kind. The word miracle in the Hebrew Bible called the Old Testament is designated by nes or oth which both mean "a sign". Although the Jews accepted the reality of miracles, there were certain categories of miracles that they expected the Messiah alone to do. The Torah provides instructions for a cleansed leper to show himself to the priest, but no Israelite had ever been healed of leprosy. The only Old Testament healing happened to a Gentile, Naaman the Syrian 2King 5 . Therefore the Rabbis concluded that cleansing a leper would be a sign of the Messiah. The Rabbis recognized demon possession and had formula for casting out demons. These formula depended on learning the demon's name. Since a dumb demon would not allow its victim to speak, there was no way of learning its name and therefore no way of casting it out. So the casting out of a dumb demon was said to be something that only the Messiah would be able to do. A third category of Messianic miracle was healing a man who had been blind from birth. Creation — The creation of the universe, the Earth, and life on Earth is said to have taken place over the course of just six days. The specific description of the creation events are described in the first chapter of Genesis. Noah's Ark — Humans and the plethora of terrestrial animals that inhabit our world are only alive today due to a miracle. According to Genesis 6-8 , a global flood destroyed all life on Earth except for those God saved through his instructions to Noah that he build an ark. Since the survival of much of the life on Earth was reliant upon an act of supernatural intervention, a naturalist could never correctly interpret the evidence of the flood. Naturalists must instead hold to a presupposition that life was able to survive the formation of the layers of strata without supernatural assistance. Other than the creation itself, this miracle is the single-most significant in preventing a naturalistic interpretation of Earth history. Moses — The book of Exodus describes the oppression and mass departure of the Israelites who had been enslaved by Egypt. God performed numerous miracles during this period, many through his servant Moses. The Burning Bush — God calls Moses from a burning bush to set him on a mission to help free the Israelites from slavery. Plagues Upon Egypt — God set several plagues upon the Egyptians before the Pharaoh would release the Israelites. Pillars of Cloud and Fire — After departing Egypt, God led the Israelites by a pillar of cloud during the day, and a pillar of fire at night so they could travel in the dark. Parting the Red Sea — To escape the Egyptian army, God instructs Moses to part the waters of the Red Sea and the Israelites pass through on dry ground. Jesus Christ is the only founder of a major world religion that had His miracles recorded within a generation. This special feature is of importance when conducting historical criticism through exegesis on the New Testament and specific miracle claims. Critics occasionally try to attack the miracles of the biblical text by claiming other religions report the same phenomena. The argument usually states that if Christian claims are to be taken seriously then all other major religion's miracle claims should be taken equally seriously. This is usually stated without consideration of the early reporting feature of the Bible. It is not enough to say that other religions claim the same, because credibility lessens the wider the gap is from the event and time of writing about that event. An especially important consideration in historical investigations because the wider the chronological gap is the more potential for falsehoods to form. Non historical elements about a particular event in history maybe incorporated quickly as well in few instances, so while early reporting of miracles by Jesus is good evidence of substantive history within the NT, it should not be taken alone. Star of Bethlehem — The birth of Jesus was marked by a light that led oriental scientists from distant countries to the exact place where Jesus lived in Bethlehem. Although many try to employ an astronomical phenomenon to explain this event, several aspects of the light defy naturalistic explanations. Jesus — The canonical gospels contain closely parallel accounts of the life of Jesus Christ and His ministry, which include the numerous miracles He performed. Christ also was subject to a miraculous resurrection event in history (Acts 1:21, 2:24; 1 Corinthians 15:4-5). Jesus Raising the Dead — Matthew 9:18-26 , Mark 5:35-43 , and Luke 8:49-56 contains the story of Jesus resurrecting the young daughter of a synagogue ruler following her death. 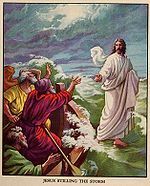 Jesus Walking on Water — Matthew 14:22 , Mark 6:45-56 , and John 6:16-24 describe an event where Jesus walks on water to reach the boat in which his disciples were traveling. When Peter sees Jesus, he also gets out of the boat and walks to Him on the water. Many modern skeptics claim that miracles are impossible because they violate the laws of nature discovered by scientific enlightenment for the past several hundred years. They support a completely material worldview where there is only the natural world discovered by our sensory system. There are only completely natural causes with completely natural effects, that constitute laws of nature that then give predictability for experimentation of the scientific method. John Lennox a prominent Christian scholar has taken particular issue with this stance by atheists that disregards free will during his public debates and interviews. Lennox essentially has articulated an example of how something from the outside can effect something on the inside of natural laws. For if you had 100 dollars and went to bed to wake up with 50 dollars, the laws of arithmetic could not tell you anything other than the difference between numbers. Yet it does not take long to realize that the money was stolen. The laws of arithmetic have not been broken is the point, in fact they remain completely unaffected by the change in the amount of money. Lennox states; "it is my knowledge of the regularity of the law, if you like, that enables me to tell that someone has put their hand in the drawer." Knowledge of scientific law allows the person in the example to understand two important things about science and miracles that must be thought of together. First, that the law-like regularity of nature remains unbroken and unaffected by free will. Secondly, and more importantly the example demonstrates how personal agency, that is free will, can produce a radical change from outside the confines of a natural law. Extrapolating up to that of the will of God, this is precisely how He is able to cause miracles within nature while at the same time not violating the laws of nature. For example, we don't set aside or violate the laws of gravity in order to achieve powered flight. Rather we invoke another set of laws, that of aerodynamics. Clearly we still need gravity to be operational to provide the necessary atmospheric pressure that allows aerodynamics to work. Neither set of laws breaks or violates the other. We simply use another set of laws to achieve the goal. In this regard, God created a grand architecture that integrates his various laws for his own purposes. When he performs a "miracle", he is using pre-existing laws of the creation. The Resurrection for example, is not a suspension or breaking of law, but of leveraging one or more other laws to achieve the goal. It is necessary to beware of fake miracles. First, there are some ministries that claim to do miraculous healings, but these are either false — a woman was told she was cured and told to stop her medication; she died — or so subtle as to be unverifiable. For example, claims of cures of having one leg shorter than another (a very rare complaint, according to doctors) have been very frequent in certain quarters. Second, miracles are not necessarily a proof of divine power. The source of power for miracles is the realm of the spiritual, but not every spirit is good. God allows evil spirits a certain degree of power, and many spiritualists, mediums, psychics and faith healers get their power from these evil spirits. One must study the Bible to know how to discern between what is truly from God and what is from Satan. Craig Keener in his 2011 two-volume work called Miracles: The Credibility of the New Testament Accounts specifically addresses the bias of scholarly discourse against interaction with miracles. Originating in the work of David Hume, skepticism about miracles has dominated the academic understanding of biblical scripture since his time. Keener calls this line of criticism a "long-standing albeit declining Western philosophic tradition". The bar is set to an unreasonable level that "no individual miracle claim could ever be accepted as valid." Although limited by no archeological evidence for the miracles of the New Testament within the Bible, Keener determines conclusions that have to be met by "Humean" skeptics. David Hume (1711 to 1776) articulated one of the most famous arguments against miracles within An Enquiry Concerning Human Understanding. "Miracles are not possible," some claim. Is this true? This page was last modified on 19 September 2017, at 22:51.